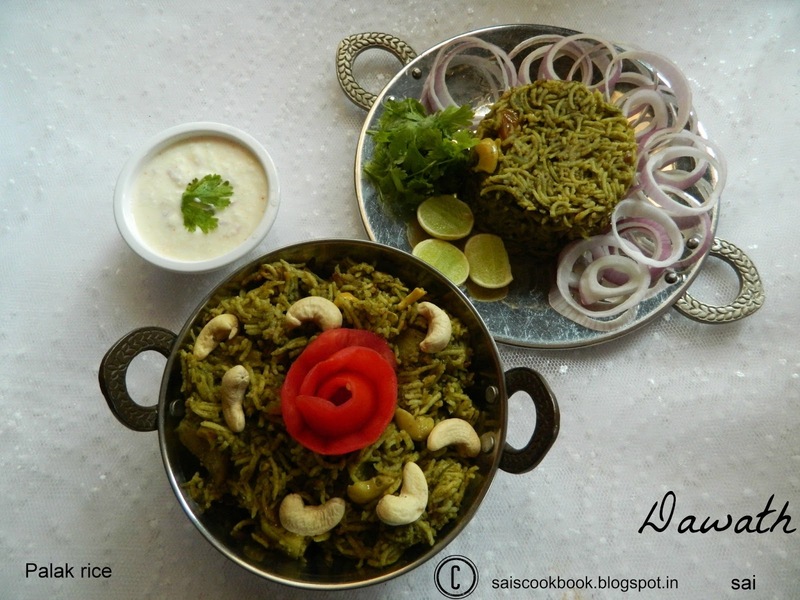 Palak rice reminds me of Utsav restaurant where we used to get the best palak rice.Now its been a long, long time since I had from there.Keeping that restaurant taste in mind I created this rice,as it is rice delicacies is my forte ,this rice turned excellent.Most of the rice dishes, I prepare in the cooker and it comes just perfect.You may also prepare this rice in a broad dish by closing the lid and cooking in simmer,choice is yours.This rice goes well with raita or just like that.Palak is an excellent source of iron and this is the best way to treat your kids and elders with a healthy rice. Soak rice in water for 30 minutes, drain it and keep it aside. Boil the palak in water until it gets cooked,remove it from flame and immediately run under cold water to retain its green color. 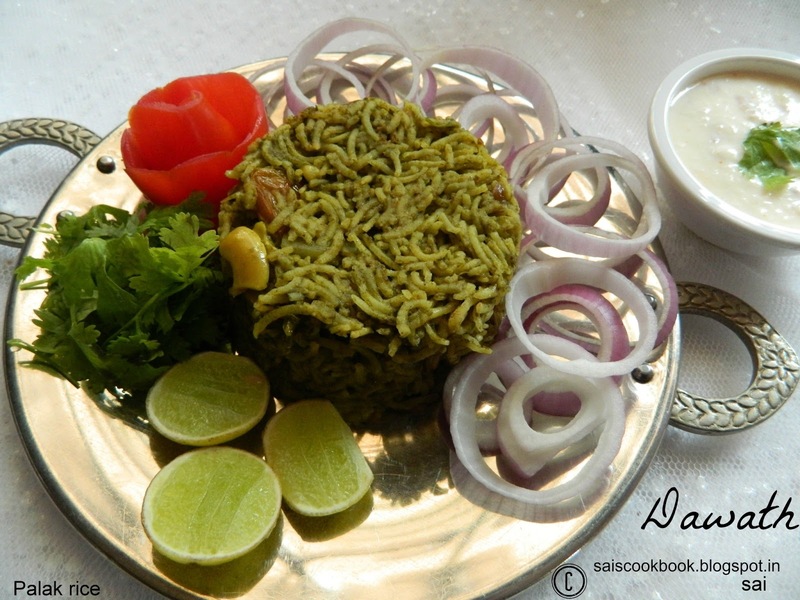 Blend the boiled palak along with green chillies in a mixer to a smooth paste. Heat ghee in a cooker and fry onions until pinkish in color,add palak paste and ginger garlic paste and fry until raw smell disappears. Add turmeric powder,garam masala powder and tomatoes and saute for a minute. 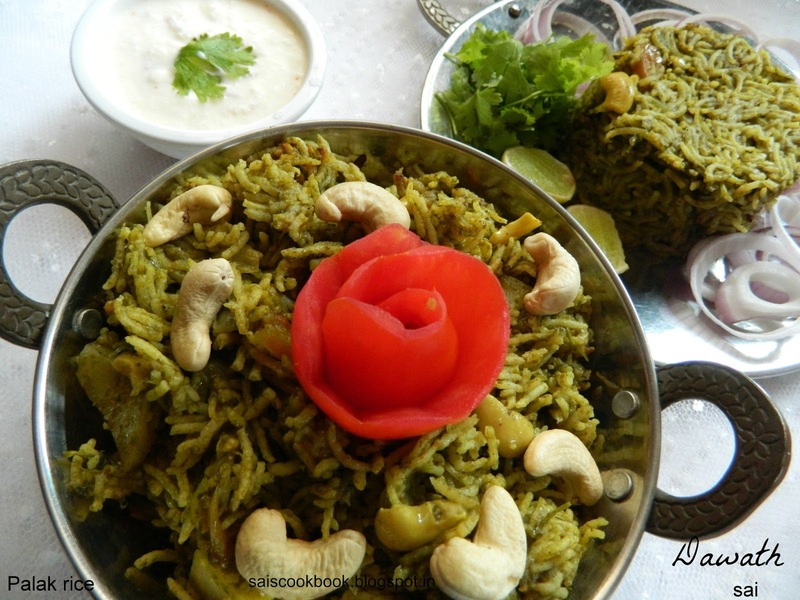 Add rice,cashews,potato,salt to taste,water,coriander leaves and milk. Take a boil,check salt and close the lid,exactly take a whistle and off the flame,once the pressure releases open the lid.